I’ve never done a book review before but I have such a connection to this book I thought I should! I don’t even think i’d call it a book review its more of a book rave, because I can’t wait to rave about how much I loved this. 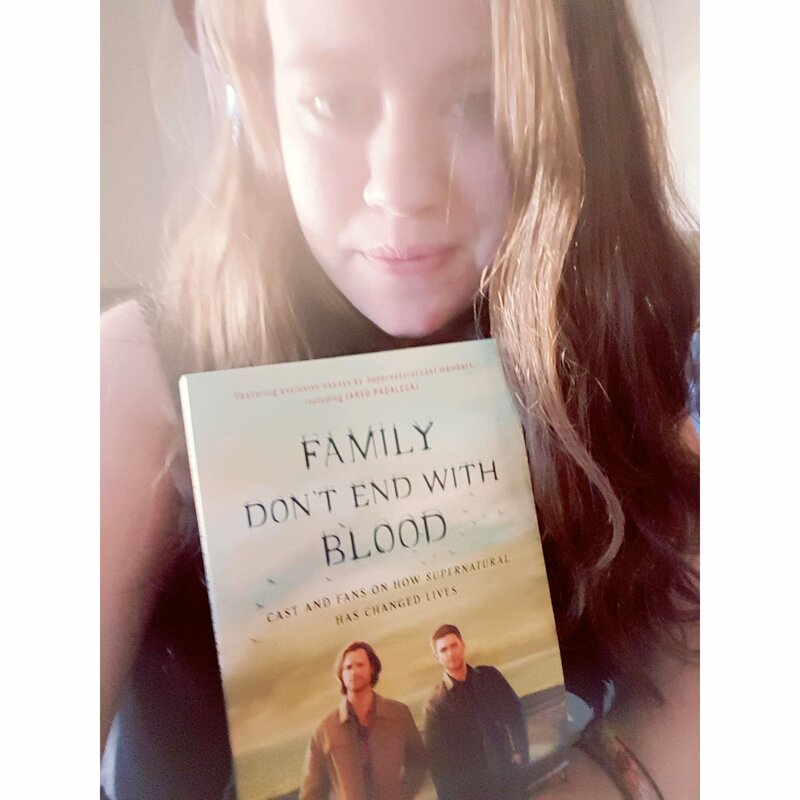 Family Don’t End With Blood, is a book put together by the Supernatural family, edited by the wonderful Lynn S. Zubernis. As you may or may not know, I am a HUGE fan of Supernatural, and the show has the most incredibly meaning to me. And if you too are a fan of this show, I highly recommend finding this book on Amazon or barnes and noble and find the time to sit down and hide away in it. That’s why I had to get this book. Inside are fan accounts, as well as stories from the cast as to what this fandom means to them. 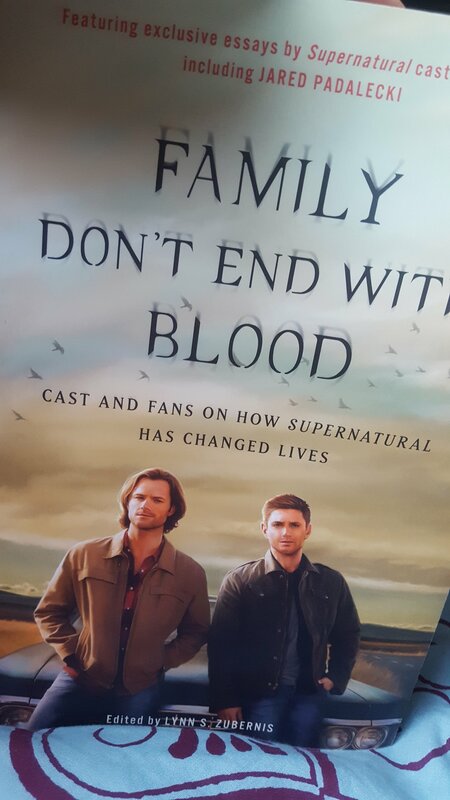 Fans and Cast alike bare their souls on the pages of this book to let each and every one of us know that we aren’t alone in how important this show is to us. To us, the show is more than just a TV Show, to many of us, me included, it’s a lifeline. My family and friends do not understand this. they don’t understand that Supernatural isn’t just a TV show. Jensen and Jared and Misha aren’t just actors, and the Winchesters and their favorite angel aren’t just characters. They don’t get that this show has saved my life, that Jared Padalecki has saved my life. Anytime my anxiety and depression get out of hand, which is more often than not these days, I hang on to his words of “Always keep fighting” and that’s exactly what I do, I keep fighting. The show has given me an escape from life. A little bit of good, in a whole lot of bad. Even if it’s just for an hour, or five during a netflix binging session. I relate to the characters of Sam, Dean, Bobby, Cass and so on, just like I relate to Jared in his mental health struggle. Because I can relate to them, I don’t feel so alone when my life feels completely out of control. Because my family and friends don’t get this concept, I was starting to think I was crazy. So hung up on these people I’ve never met and these characters that aren’t even real people. Over the last year I’ve realized it doesn’t matter if they understand it or not because it helps me. It’s what I need for myself. And reading this book helped me so much. I read the stories of all these other strong, brave souls who use Supernatural as a lifeline just like me. To know that the cast has been changed by us just like we have been forever changed by them. I don’t feel crazy anymore, I don’t feel alone. I was so inspired by this book and everyone’s stories. The bravery to put it out there, the strength to overcome what they’ve all overcome. I couldn’t be prouder of any of them, and of anyone who continues to fight just like them, and just like me. I love being apart of this Fandom. I love hearing peoples stories, I love reading peoples tweets. I love hiding in the Supernatural tag on twitter on Thursday nights, taking an hour of my day to forget everything else and just throw myself into the Winchester story. I feel grateful to Lynn Zubernis for putting this together. I feel that if it made me feel less alone, that so many others probably feel the same exact way. They say there’s no fandom quite like the Supernatural fandom, the SPNFamily, and they’re right. We have a connection within each other, with the show, that isn’t all that common. Family Don’t End With Blood, Family can be who we choose to be our family. And I’m so blessed to be apart of this Supernatural Family. Next Post Happy Birthday To My Favorite Twins!